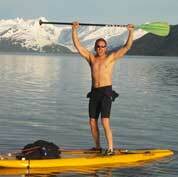 Alaskan summers are getting hotter - come and learn about Paddle Boarding from a life long Alaskan! "I have created Alaska Paddle Board GURU llc to educate fellow Alaskans on all aspects of Paddle Boarding. With a focus on safety and enjoyment as well as the low impact health benefits for aging sourdoughs such as myself. Lessons also include proper instruction on correct paddling form & stance. This is a sport you can do well past retirement age & the best part ...it is FUN."